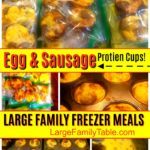 BREAKFAST FREEZER MEAL RECIPES | Protein Sausage and Egg Cups! These Protein Sausage and Egg Cups are perfect for large family breakfasts! I like to set a frozen bag out into the refrigerator the night before we have a big field trip or another outside event. This way I know the children (and momma!) will have a healthy protein packed breakfast that will fuel our bodies for our big day. In super mega large mixing bowl (I use my 30 qt mixing bowl) mix all of the above ingredients adding shredded cheese last. Use silicone or paper muffin tin liners. Fill cups 3/4 of the way full and place in preheated oven at 350 degrees. Bake up to 20 minutes. Once cooled place protein cups in desired size freezer bags. Place in freezer for up to 3 months. When you need these quick and easy protein cups in your life 🙂 place desired amount of frozen bags into the refrigerator the night before. To heat up, set protein cups on plate and microwave for 45 seconds to one minute.